Our Search is Your Satisfaction and our Mission is to rid the World of Beer Poverty one good brew at a time. To do that we need to Search the Globe and bring to Brewers the best possible brewing materials and equipment and we will continue to do this until Brewer (Home and Pro) has access to the best brewing materials delivered to your brewery door! This Oct 18 monthly is another bumper issue - Malt of the Month - Crisp Europils Malt - Adjunct of the Month - Dextrose - Hop of the Month - Hallertau Blanc - Yeast of the Month - GY005 Golden Gate Lager Gigayeast - Equipment of the Month - Malt Mechanics 30L Conical Fermenter - BeerCo Recipe Kit of the Month - Californication | EuroCal Lager and that will do for now...oh no it won't! Andrew @StassBrewing brings us his second installment of his excellent "How to Brew like a Pro!" 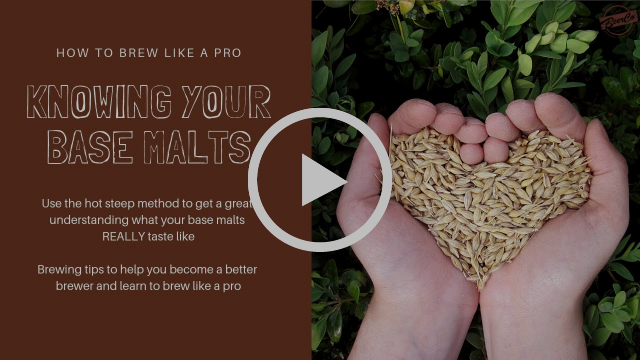 BrewTube videos on Malt where he does a very interesting deep dive using the Briess Hot Steep method of comparison into Base Ale Malt using Gladfield Ale and Crisp Maris Otter Malt and Gladfield American Ale and Crisp Best Ale Malt. We SlideShare a talk last week to Inner Sydney Brewers on Why? Crisp Malt - 3 different SMaSH Beers (recipes included in the SlideShare) and Fast Souring Techniques with Dr Jim at GigaYeast. Read on for the SlideShare from a fun engaging and entertaining night with Inner Sydney Brewers in Syncity! anhc 6 - 26-8 Oct 2018 in MELbrewin' - have you got your Tickets and accomodation sorted? Globally, pilsen or lager-style beers are the dominant beer category. These beer types demand a lower modified malt to complement the temperature programmed or decoction mashing regimes employed. Crisp Malting Group Europils Malt perfectly fits this requirement, being typically made from 2-row spring barley which is malted to give the required level of modification whilst maintaining a high level of homogeneity. Careful control of kilning ensures the required low colour is achieved. Europils malt has a higher protein content which ensures ample enzymatic capability which, combined with the high levels of free amino nitrogen present, assure excellent brewing performance even when unmalted adjuncts form part of the grist composition. 1 MT $1,550 excl GST send your wholesale orders to orders@beerco.com.au and pre-orders allow 6-8 weeks ship time for large container size shipments. All wholesale bulk Crisp Malt is warehouse in MELbrewin' and ships out 950Kg (36 x 40 Bags to the pallet) on Hunter Express or your preferred 3PL transport company. Buy Now! Crisp Europils Malt! As dextrose is highly fermentable, it facilitates the brewing of very dry high gravity beers. Often used in lighter body US style IPAs. Dextrose is also commonly used as priming sugar for bottle-conditioning. Buy some Dextrose Brewing Sugar NOW! Hallertau Blanc is a daughter of the cultivar Cascade with a fruity-floral white wine bouquet. Hallertau Blanc flavor profile is said to be fruity, with wine-like qualities of gooseberry and grass, similar to that of Sauvignon Blanc. It also features a complex aroma profile with notes of cassis and elderflower in addition to grapes, grapefruit and lemongrass. Other notes detected in trials have been passionfruit, pineapple and gooseberry. Bred at the Hop Research Institute in Huell and released in 2012. Aroma, particularly whirlpool and dry hopping to take full advantage of the very high myrcene fraction. With its pronounced tropical profile, Hallertau Blanc has strong affinity for many of the same styles as southern hemisphere hops: IPA, Belgian ales, wheat beer, and Brett fermentations. Brew a Euro-Californicator SMaSH Now! Buy Hallertau Blanc Hops! Gold Pitch - 200 billion cells per pitch $14.95 BUY NOW!!! Pro-Pitches - from 10hL to 100hL Batches drop-shipped DHL Global Express in 5-7 days to your brewery please email us at orders@beerco.com.au for a full price list. GY005 Golden Gate GigaYeast is a versatile Lager yeast used to create the California Common style. GY005 ferments warm and still retains a lager character. GY005 ferments unusually high for a lager strain and still retains a lager sensibility (up to 20˚C (68˚F)). GY005 GigaYeast leaves a slightly sweeter beer than our other lager yeast— perfect for creating a subtle, malty undertone against a clean lager background. GY005 creates a moderate amount of sulfide under some conditions that will dissipate with a short rest. Fermentations at traditional lager temperatures may be slow. Recommended fermentation temperature 13˚- 20˚C (55˚- 68˚F). Equipment of the Month: Malt Mechanics - 30 L / 8 Gal Conical Fermenter - FREE SHIPPING AU WIDE! Malt Mechanics fermenters are the only plastic home-brewing conical which come fully featured with tri-clamp fittings and stainless steel valves in 1/2" for the take-off, and 1" for the yeast-dump. The fermenters are suitable for transferring beer under pressure and come with everything you need to get your beer fermenting right out of the box. Excellent for Brewing like a Pro! at home or for Probrewers Prototyping your next core beer release with reliable consistency! We all enjoy some Eurotrash and Californication so we thought it would be cool to mash up the best Europils Crisp Malt with Hallertau Blanc GR Hops and GY005 Golden Gate Lager GigaYeast for a fast and furious yet soft and subtle EuroCal Lager. Just in time for Spring Break or Summer Pool or Porch Sessions. This mild mannered mid level ABV EuroCal Lager will have you reaching for the Kegerator Taps or Fridge all Spring and Summer long and leave you wishing you brewed a Bigger Batch! Step mash option A - Do a 5-minute rest at 56 °C, a 15-minute rest at 60 °C, a 30-minute rest at 68 °C and a 5-minute rest at 76 °C. Recirculate wort for about 20 minutes (or until clear), then collect wort until final runnings drop to SG 1.010. Single Infusion mash option B - Do a single infusion mash at 67°C until enzymatic conversion is complete. Sparge slowly with 77 °C water (est. 17L), collecting wort until the pre-boil kettle volume is around 25 L.
Boil: 90 minutes. 1st Hop addition of 30g at 60 min and 2nd Hop addition of another 30g at 5 mins from end of boil or flameout. Add your Yeast Nutrient at the same time. Cool wort and transfer to the primary fermenter oxygenating wort and pitching Liquid GigaYeast GY005 or M54 Mangrove Jack's Dry Yeast at 11° C and let free rise to 13 °C. Maintain at 13 °C for 14 days. Raise temperature to 17 °C for 7 day maturation rest. GY005 does not throw much diacetyl, so this step is to knock the subtle acetaldehyde down and expedite sulfur scrubbing by CO2. If filtering, transfer to Corny keg and crash cool for 2–4 days and filter using your normal method. If not, crash cool and lager for 10–14 days until desired clarity is reached and sulfur aroma/flavor from yeast in suspension is not detectable. Target a carbonation level of 2.2 to 2.7 volumes. Drink Fresh or Lager (store cold) for a few weeks. Prost! Food pairing - Spring Rolls, Steamed Mussels, BBQ Pork, Fried Fish Tacos, Delicately Herbed Chicken, Calamari, Oysters and Crab, White Cheeses, Salmon and Hot Dogs. Yeast - 1 x Liquid Gold Pitch of GY005 Golden Gate GigaYeast or 2 x 10g Dry Yeast Sachets of M54 Mangrove Jack's California Lager Yeast. Californication | EuroCal Lager - All Grain BeerCo Recipe Kit is here! Buy NOW! 1) Crisp Malt - Why? Another entertaining and engaging evening with Inner Sydney Brewers club at Atlassian. Special thanks to the committee for the invitation and Roman, Conan and Luke for brewing the SMaSH beers and our supply partners Crisp Malt and Hop Products Australia and GigaYeast for information and support with our sponsorship! See below for the SlideShare from the night! Price of entry is two bottles of your finest brew to swap with new friends you meet on the day. We will have a few kegs on and some eats to keep the meetup on track and help kick off an exciting anhc conference weekend with a fun friendly welcome event.